Appearance (0-20): Pepin absolutely hit the mark with the look of the Blue Label here. Its got a very nice looking corojo wrapper that it oily to both the touch and to the eye. The blue label band is a relatively simple one, calling out that it is indeed a Pepin blend – but it looks almost perfect against the darker corojo backdrop. There is one medium sized vein along the top, but it disappears along the cigar band. Construction (0-20): Interestingly enough, this bad boy really seemed to be packed perfectly. From the way it felt, there was no worry at all with the tobacco ratio being off. The cut revealed... nothing, or as close to it as I have ever gotten with a cut, aka almost literally no debris. The draw was amazing, having just the slightest resistance prelight. That same minor resistance held on until the last inch of the cigar. Whats more though is the ash held on for at least 2 inches at a time. Overall it was simply impressive. The one and only one single negative I had was that it burned slightly unevenly, although it tended to even itself out eventually. Strength (0-20): I knew from the beginning that this was going to be a full octane cigar, and there was no denying that it indeed was. I would actually think that this one is on the lighter side of the full scale, as it isn't completely power packed, but its enough to still make your head spin. Flavor (0-20): From when I picked up this cigar, all I could think was, “Well, I guess I'm in for a nice peppery ride.” If this were a normal Pepin blend, it would have been. But instead I was greeted with a surprising array of complexity. Its rich and creamy with some delicate pepper undertones when you begin, with some nice leathery flavors meshing in very well. When it continues you find some amazing coffee tones to add to the mix... and then... cedar. I was literally astounded at the way this one progressed, and then in the final third of the cigar it seems like you get hit with each and every one of those tastes again. There are times during the cigar that the transition between tastes wasn't quite as smooth as I would have liked, but overall, it was a really interesting taste. Value (0-20): This stick is worth every penny of the $8.00 price. No questions asked. I sincerely believe it easily holds its own with other heavy hitters at the same dollar value. Additional Notes: Smoked at CI, paired with Glenlivet 12. 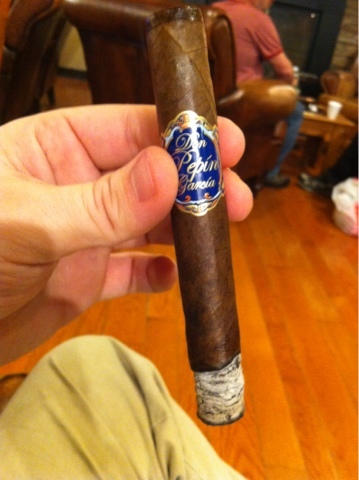 Overall (0-100): I found this to be a really good cigar overall. It was very well constructed and had what I would consider to be a relatively unexpected flavor profile. 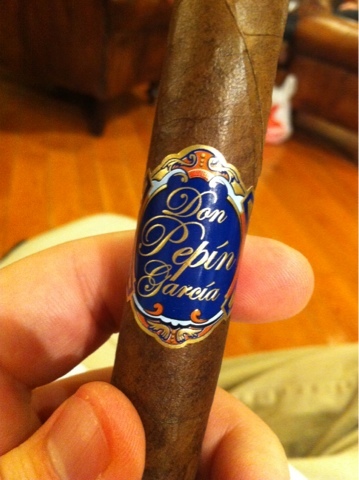 While most Pepin blends are a pepper filled extravaganza, this one differed from the norm in a very good way. Theres a slight knock on a few categories, but honestly speaking, its an all around good cigar that I would smoke any day of the week. Nice review Ninja Man. It's been a while since the smoked the blue label but I definitely feel these taste much better with some time on them. id agree too. its a very solid choice for a smoke, but it does tend to get better with age.